With the month of July coming to an end, let us take a look back at the month that was… well rather hot. We had 15 days that were above 90° and to make matters worse, the “coolest” day we had was on July 13 when our afternoon high reached 81°. We had back-to-back days of 100°, but we all know it felt much hotter than that. Rain came along and unfortunately, it came all at once, at the end of the month and in the matter of a couple of days. Rockford ended up with 4.60 inches of rain for the month of July. As we peek into the month of August, it appears that temperatures and rainfall amounts will be average. August average high temperature is 80.9° and the average amount of rainfall is 4.21 inches. I can tell you now that the first day of August will remind you of the hot and humid days of July. Hot and humid conditions are starting to work their way back into the Stateline area. A heat advisory is in effect for Jo Daviess, Stephenson, Carroll and Whiteside Counties until 7pm Tuesday. Temperatures will gradually rise into the lower and mid 90s. Combining that with dewpoints in the 70s will create heat index values in the triple digits. The hottest days looks to be Tuesday, as our next storm system puts us in the warm sector. Temperatures by then could easily get into the mid and maybe a few upper 90s locally. That will skyrocket our heat index values past 110 degrees. This heat advisory expires on Tuesday evening thanks to the passing of a cold front, which will drop our humidity levels as well bring in a round of showers and thunderstorms. A funnel cloud with no severe storms…say what?? What a sight to see! Many walked outside yesterday afternoon to find a rope funnel stretching down from a field of cumulus clouds in DeKalb and Ogle counties. Severe weather was not in the forecast, as the atmosphere was not primed for thunderstorm or tornado development. The combination of low level convergence (or air coming together near the Earth’s surface) and a pocket of moist air located under the updraft region of the cumulus field was what caused the funnel cloud to form. Vertical wind shear (or the change in wind direction with height) added some weak rotation and aided in the funnel’s extension from the cloud towards the surface. No break in the humidity! A Flood Warning continues for Stephenson County and Whiteside Counties in northwestern Illinois. Water continues to drain to the Pecatonica and Mississippi River after recent torrential rainfall. The good news is that we aren’t expecting major flooding due to an extremely dry first 2/3 of the month. In Rockford, we only received .19″ of rain from July 1st to the 21st. His rapping skills may fall a bit short of Slim Shady, but they did pull this live shot off pretty well. What do you think about the Base Jumping-Rapping Weatherman? DUBUQUE (KWWL) -Mayflies, fish flies, barge flies — regardless of the chosen term, these insects hatched from the Mississippi River and swarmed Dubuque Saturday night.Since then, businesses have been busy cleaning up piles of mayfly carcasses. The insects have a life span of less than 24 hours. 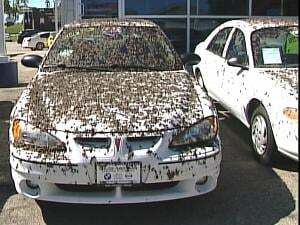 Heavy rain Sunday morning plastered the dead mayflies to streets, windows and cars. That’s no good for the Dubuque Auto Outlet, used car manager Kevin Lynch said. Mark Wagner is the education director at the National Mississippi River Museum and Aquarium. He said the mayflies are a good indication that the Mississippi River is in good shape, as a polluted river couldn’t support such a hatch. He said Saturday’s hatch was an average size, even though the mayflies reach several miles inland from the river. “I thought, ‘This is great. We love to shovel snow in the winter, and now we get to shovel fish flies in the summer,'” Lynch said. Employees spent the day power washing the cars. Mayflies can hatch out of the upper Mississippi River, as well as other Eastern Iowa rivers and some lakes. 5:55pm – A weather watch is possible for parts of our area this evening, according to the Storm Prediction Center. Read the technical discussion here. 5:30pm – Unfortunately, we have more rain on the way. However there are some noticeable differences between the set up tonight and the set up last night. The image to the left shows the CAPE, the convective available potential energy, or the fuel for thunderstorms. The blue, shaded region is the convective inhibition or CIN. With significant CIN, the CAPE cannot be utilized to produce thunderstorms. Still, we lie on the CAPE Gradient, an area favorable for thunderstorm development. With rainfall totals near 6 inches in Stephenson County and over 10 inches in parts of JoDaviess, we certainly do not need anymore precipitation, but our wish may not be granted this afternoon. A frontal boundary is situated right along I-80 as of the noon hour. Storms will likely fire along this front much like they did last evening. Precipitable water values over 2.5″ overhead mean that if you were to condense the water out of a column of air, that is how much rain you would get without any further action. We will have the potential for more flooding this afternoon and tonight depending on where storms set up. As of now, the heaviest rain may occur a bit further south of hardest hit areas.